Atlas Copco launched a new air compressor concept with the new XAS 27 (27 l/s, 7 bar) compressor. The XAS 27 compressor is the first in the Atlas Copco Portable Air compressor range powered by a petrol engine. And the unit has been designed to offer exceptional versatility by having the most compact dimensions in our portable compressor range. The new XAS 27 is driven by a tough and reliable Honda engine, which exceeds existing emissions regulations. It has a V-Belt drive with a belt tensioning rail system. The engine drives Atlas Copco’s new C55 element. 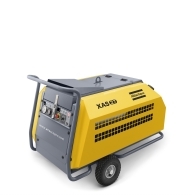 The XAS 27 is also the very first compressor with a petrol (gasoline) engine in the entire Atlas Copco Portable Air range. Whether being used for running pneumatic breakers, chippers, hammers, or small hand tools, this one-tool compressor can handle projects such as demolition, finishing and renovation. The XAS 27 is compact and very agile. It weighs just over 200 kg, and its undercarriage allows you to transport it wherever you need to go without any heavy lifting. As a result, you can easily handle it and manoeuvre it into the best working position. The XAS 27 is even small enough to fit through commercial doorways or an elevator. The compressor is simple to operate and to maintain. The XAS 27 has our successful polyethylene concept taken from the HardHatTM- line combined with zincor treated steel to give protection. The fuel tank is part of the canopy and incorporates an electric fan for efficient cooling. With the hood open, the XAS 27 is also very easy to service. You can easily access the air oil separator, its spin-on filter and all the other filters, so you can make optimal use of the XAS 27 without expensive service costs. There is also a trolley design version, if an even simpler and more compact compressor is needed. The XAS 27 offers exceptional value combined with power, reliability and durability. Everything you need to get the job done.